Each year, the FLG Lacrosse staff is becoming more and more excited about the girls program. As the number of teams continues to expand, the FLG girls had been able to elevate their games, both individually and as a team, to not only compete with the top talent in the country, but to beat them. Their success on the field was largely matched by their activities off the field, as the girls bonded all summer in any setting they were in together, from FLG camp to weekly practices. The 2019 girls served as an embodiment of selflessness, one of the most important values taught at FLG, on their way to securing two tournament championships this summer. Parents and coaches alike felt inspired as they watched the girls become a team both on and off the field as the summer went on. It was hard to contain the excitement and the roar of the FLG sideline as they cheered the girls on! Equally as impressive in their 2014 campaign, the 2018 girls established themselves as one of the closest knit teams in the FLG program. Their team chemistry and hard work in weekly practices helped them win three tournaments in a row, building more and more momentum as the weeks went on. The girls were able to take what they learned from Coach McGinty and Coach Chiarenza on a weekly basis and improve their individual games, which improved their team play tremendously. Effort was the driving force behind making the talent of the 2016/2017 girls team stand out this summer, competing and contending in every game. No matter what situation the team found themselves in, their effort and determination were always present, resulting in major wins during both the Summer Slam and Capital Cup tournaments. The team’s record of three wins and one tie at the Capital Cup, one of the nation’s most competitive recruiting tournaments, served as a testament to the team’s dedication to improving as the summer went on, both individually and as a team. The 2015 girls team was tested in more ways than one this summer. The girls were asked to be at their best as a team each weekend, going up against the top talent in the country, as well as individually, showcasing their skills to college coaches. Despite many teams who would have backed down from the challenge, the 2015 FLG girls rose to the occasion and one of the most successful summers an FLG girls team has had. In a fitting conclusion to their FLG careers, the girls showed impressively at the Capital Cup tournament, a representation of the success they have had in the FLG program, both on and off the field. FLG was proud to add numerous additions to the boys program this year, notably select teams in the elementary boy ages as well as the first-ever all committed select team the country has ever seen. However, in a summer characterized by new accomplishments, the FLG boys carried with them the time tested core values that the FLG program was founded on, both on and off the field. As each young man learns on the first day as a member of the FLG program, it is just as important that they learn to be a great person, friend and family member as it is to become a great lacrosse player during their time playing for FLG. This year’s boys definitely set the standard for excellence for next year’s teams to carry forward! The 2022/2023 boys team had a summer for the ages. The team’s strong showing at the FLG Spring Shootout set the tone for the rest of the summer, giving them the motivation to compete with anyone they went up against in the country. Week in and week out, coaches, Terry Kennedy and Liam Kennedy, could not say enough about how excited they were to get to work that week and see each boy show up to practice, eager to get better. Safe to say, the future of FLG looks bright with the 2022/2023 boys team leading the way! The 5th grade lacrosse world was taken by storm by the FLG 2021 boys team this summer. With defense providing a consistent backbone throughout the summer, the coaches were able to watch the team grow together with every practice. The boy’s hard work culminated at the end of the summer with the team’s most impressive win when they beat LB3 in overtime to avenge a loss suffered earlier in the tournament. The ability of the FLG 2021 boys team to bounce back and overcome adversity in the last tournament could not have been more of an accurate representation of the values and life skills the FLG program hopes to teach their players. While success on the field is not the only thing FLG strives to accomplish during the summer, the 2020 boys sure seemed to have a lot of it in the 2014 season. The team captured the championship at the Harvard Crimson Classic in dominating fashion, making the FLG program repeat champions in Boston. With Coach Mike Winkoff at the helm, the boys carried their winning ways through the summer, finishing with an impressive third place performance at the FLG in 3d national tournament among the top talent in the country. The impressive season that the 2019 team had last summer set the bar pretty high for this year’s team to live up to. It was no surprise, however, that the 2014 team was able to meet expectations and exceed them. The team’s hard work at every practice and attention to detail when preparing for the tournaments allowed the boys to achieve their goals both on the field, with impressive wins at the NXT Cup and FLG in 3d, as well as off the field, creating friendships and lifelong bonds these boys will carry with them as they continue to grow as players and young men. The 2018 boys learned an important lesson from the moment they made Coach Corey Winkoff and Coach Eric Dunne’s squad: Success is impossible to achieve if you lack discipline. The team would be challenged both physically and mentally any time they stepped on the field for FLG and, as shown through their accomplishments both on and off the field this summer, it was clear that the boys stepped up and answered the bell every time. 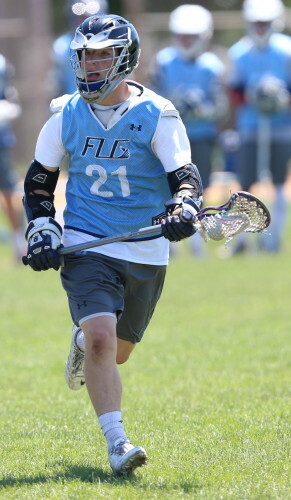 Characterized by unselfish play on the offensive half of the field while being tenacious and cohesive on the defensive side of the ball, the team performed impressively in all of their summer tournaments, peaking in their final time together as a team in Maryland at the FLG in 3d National tournament. There is no doubt that each member of the 2018 is ready to take the skills they learned this summer and use them to have an immediate impact at whichever high school they attend in the fall. It is no easy task to make the transition from middle school to high school level lacrosse, especially as the landscape of college recruiting becomes increasingly younger and younger. That is why the performance and accomplishments of the 2017 boys team this summer was particularly incredible. The team rounded out the season with a winning record, topping the season off with an impressive 4th place finish at the u15 National Championship. The greatest accomplishment of the 2017 boys this summer for the coaches was how they concentrated on being a team during a point in their careers where so much attention is put on individuals. The reliability demonstrated by one another took this team to another level and as a result, the success the boys had as a team allowed many of the players to earn individual recognition, making all star teams at both tournaments and national camps. While there are many words that can be used to describe the 2016 boys’ summer, restful is not one of them. Between practices and tournaments every weekend, the team got to spend a lot of time with each other and their coaches, allowing the team to build chemistry. That chemistry would end up playing a vital role in the overwhelming success the boys had this summer as seen by the 20-5-1 record. The third place finish at the first- ever IL Invitational tournament really put the members of the 2016 boys on the radar of college coaches from across the country, giving them plenty of momentum to capitalize on, when the high school spring seasons come around. In their final season as players in the FLG family, the 2015 boys certainly left their mark on the summer lacrosse circuit. Refusing to stop learning or not give it their all, the team of high school juniors truly showed the FLG family what it means to never stop working on your game and not allowing yourself to be satisfied. Their enthusiasm, along with the numerous wins that the team achieved throughout the summer, enabled the boys to achieve as much exposure to the college coaches as possible. More importantly, it has been incredible to watch the players grow as both players and young men during their time with the FLG program. We are excited to watch where each boy ends up taking his game for their college career and following him as they continue to achieve success. For the first time, FLG was proud to announce the newly all committed players team into their program this year. A concept yet to be unveiled anywhere else, the FLG Committed Team was comprised of players already committed to play college lacrosse. The team was largely started in an effort to keep kids motivated to improve their game after committing, in addition to providing an opportunity for players to continue playing with each other in an environment less stressful than the college recruiting circuit. The inaugural Committed Team had a hot start to the summer, taking the Best of the Best tournament championship. The boys ended their successful summer in Lake Placid, where they were able to enjoy time together off the field and win games on the field – a truly fitting ending to their FLG careers. The summer of 2014 was as successful as ever for FLG teams across the board, from watching young men and women commit to colleges to tournament championships. More importantly, it has been a pleasure to watch each FLG player mature as a player and a person, carrying with them the core values that FLG strives to teach in their athletic, academic and personal lives. The FLG staff wishes a safe and relaxing rest of the summer to all of its players and parents, and hopes to see everyone at tryouts in the fall!